Mild steel is a type of steel alloy, which contains a high percentage of carbon as a major alloying agent. Alloys are simply a mixture of one or more metals with non-metals, designed to give specific improved properties over the parent base metal. Mild steel is the type of steel, which is used in the majority of all steel internal and external applications in the UK. Steel is a range of alloys principally of iron, with 0.2% to 2.1% of carbon, acting as a hardening agent. As well as the carbon, there are many metal elements that are a part of steel alloys and have a great affect on their properties. The elements other than iron and carbon used in steel can be a mixture of some or all of these; chromium, manganese, tungsten and vanadium. These elements in addition to carbon, act as hardening agents. By hardening agents we mean they create points within the iron crystal lattice layers preventing the layers from sliding past each other. They do this by attaching themselves to the interstitial sites within the crystal structure and act as a block on lattice movement. This is simply why steel is harder than iron, the addition of alloying agents. When the alloying agents are varied different grades of steel are produced with different practical industrial uses. The higher the percentage of carbon and other hardening agents within the steel the harder the steel will become but with a consequent reduction in ductility. Mild steel may also be thought of as steel which is not stainless. Mild steel and low carbon steels mainly differ from stainless steels in having a much lower percentage of chromium. Stainless steels do contain a much higher percentage of chromium than standard mild steels giving them a better resistance to corrosion but at a higher financial cost. The addition of carbon does make mild steel stronger and stiffer than other types of steel. This increased hardness is balanced by a reduction in the ductility of this alloy. Carbon atoms fix themselves to the interstitial sites of the iron matrix and increase its strength. Other than the maximum upper limit of 2 % carbon in the mixture of carbon steel, the percentages of manganese at 1.65%, copper at 0.6% and silicon at 0.6% are fixed. The percentages of the elements; cobalt, chromium, niobium, molybdenum, titanium, nickel, tungsten, vanadium and zirconium can vary from batch to batch. Mild steel has ferromagnetic properties. This makes it ideal for manufacture of electrical devices and motors parts. The average industry grade mild steel density is 7.85 gm/cm3 and its Young’s modulus is 210,000 Mpa (measure of stiffness). Mild steel is the cheapest and most versatile form of commercially available steel used as sheet metal, bar, rod and sections. The high amount of carbon within its structure makes mild steel vulnerable to corrosion (rust). 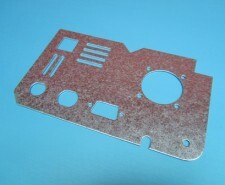 If you need a rust free sheet metal steel product then surface finishing/treatments will be needed or stainless steel will need to be substituted for mild steel. These are the main properties and uses of mild steel. 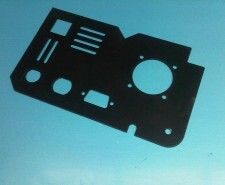 We use mild steel sheet everyday for a vast range of sheet metal work for our customers. But, the majority of sheet metal products we manufacture from mild steel have to have some sort of protection either as a surface treatment e.g. 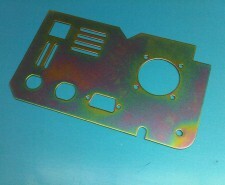 zinc plating, Zintec or a finish e.g. powder coating to prevent them from corroding. Cold reduced, mild steel sheet is first electrolytically cleaned and then pickled to give it a clean, smooth oxide free surface before it’s coated with a uniform, electrolytic deposit of zinc or a zinc-nickel alloy. 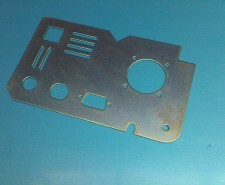 The plating processes are used to control the finished coating thickness on the sheet metal. The plating process can be used to produce single sided and differential coatings as well as the standard double sided coatings that are most commonly supplied. We use Zintec sheet metal for metal work that doesn’t need a full zinc plate treatment but would rust if only made from mild steel. Many internal components are ideally suited to zintec steel such as electronics chassis, lighting gear trays, brackets, sheet metal enclosures and cabinets and any sheet metal fabrications that won’t be getting wet and are not cosmetically important. 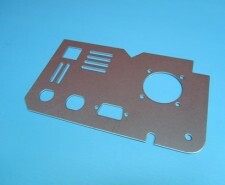 You will see many examples of sheet metal components from from zintec throughout our website. Sheet metal work can always be made from Zintec sheet even if it’s going to be powder coated afterwards as this zinc layer can act as a good protective undercoat for the component. Hot dipped galvatite sheet metal is produced by an integrated continuous line which anneals and coats both sides of a cold rolled sheet metal steel strip coil with a thin layer of zinc by being dipping in a molten zinc bath. The line incorporates equipment which controls the coating mass, surface finish and flatness of the sheet metal strip coil after zinc coating. We use galvinised sheet metal in much the same way as zintec sheet but it does have a thicker zinc layer so does offer a little more protection against corrision. With the right pre-treatments zinc can be deposited on almost any parent metal but the most common are ferrous (those containing iron) materials, however certain materials such as various cast irons and carbonitrided steels will require processing in specific types of zinc baths. including differences in their appearance, successful coverage of deep recesses, coating thicknesses and certain mechanical properties such as the ductility of the final resultant deposit. 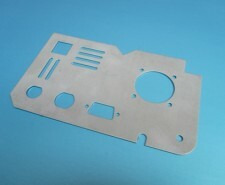 (For more information on their specific uses we can talk directly to the zinc platers for you. We tend to be asked to have mild steel sheet metal components zinc plated and clear, colour or black passivated where the protection against atmospheric corrosion is more important than the final cosmetic appearance. Zinc plating being a surface treatment can vary in colour from batch to batch and matching components can be problematic, if a consistent finish or colour is required then powder coating or wet spraying may be considered.